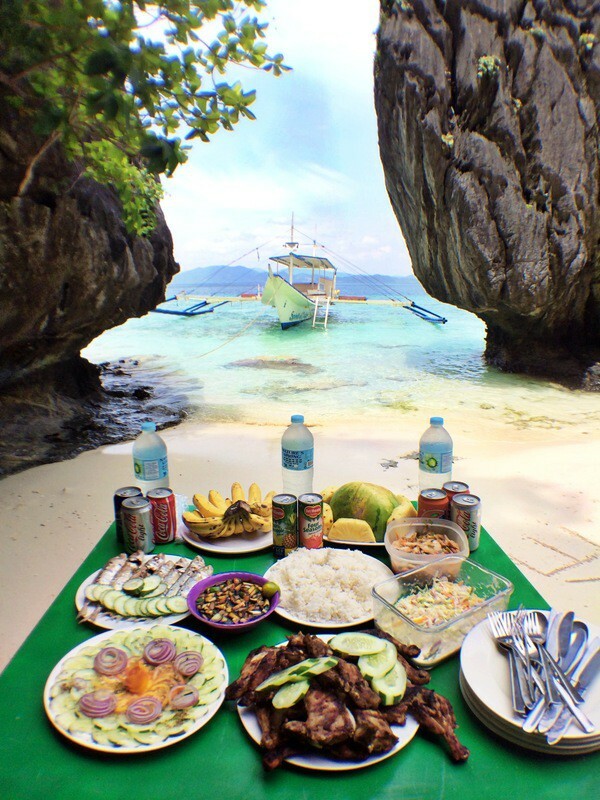 Island Hopping is the best way to take advantage of El Nido’s clear blue waters and white sand beaches. Our resort is right on the ocean, and we have two boats (“bangkas”) we take out daily for tours with our guests. The tours are standardized by the local government so they will feature virtually identical stops no matter where you book. We include snorkel gear and fins at no extra cost, and we get your ETDF form for you, saving you a trip to the tourism office. Plus you’ll love our warm, friendly staff and delicious lunch! Our boat at Shimizu Island (Tour A), along with a freshly grilled lunch and bottled water. Lunch consists of two meats (usually pork and fish) grilled over charcoal. Vegetarian options are available upon request. Please note that because we are a small resort and all our guests may want to go on the same tours on the same day, so you may not go out on our boats. But we are friendly with the local resorts on Caalan Beach, and will make sure that you get on the tour of your choice with one of our trusted friends. Tour A: Lagoons and Beaches Tour A visits Big Lagoon, Secret Lagoon, Shimizu Island, 7 Commando Beach, and one other stop. The rate is 1,200 PHP/person + 200 PHP/person for an Eco-Tourism Development Fee (ETDF) * + 200 PHP/person to visit the premium Big Lagoon stop. Tour B: Caves & Coves Tour B visits Pangulasian Island, Cudognon Cave, Cathedral Cave, Snake Island, and Pinagnutuyan Island. The rate is 1,300 PHP/person + 200 PHP/person for an Eco-Tourism Development Fee (ETDF). Snake Island is a sand bar that connects two islands. The water is so shallow you can just walk across. Tour C: Hidden Beaches & Shrines Tour C: Secret Beach, Hidden Beach, Matinloc Shrine, Tapiutan Island, and Helicopter Island. The rate is 1,400 PHP/person + 200 PHP/person for an Eco-Tourism Development Fee (ETDF). 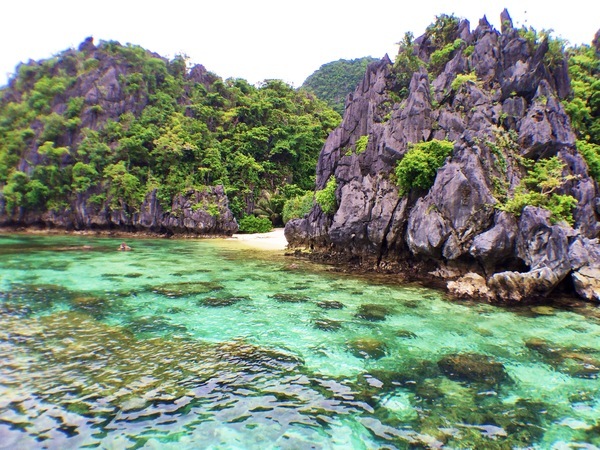 Tour D: Island Beaches Tour D: Nat Nat Beach, Pasandigan Cove, Cadlao Lagoon, and Bukal Island. The rate is 1,200 PHP/person + 200 PHP/person for an Eco-Tourism Development Fee (ETDF). * The local government requires tourists to pay an additional 200 PHP “Eco-Tourism Development Fee” (or ETDF) to go island-hopping. The ETDF is good for 10 days, and a single ETDF allows you to go on all of the tours. 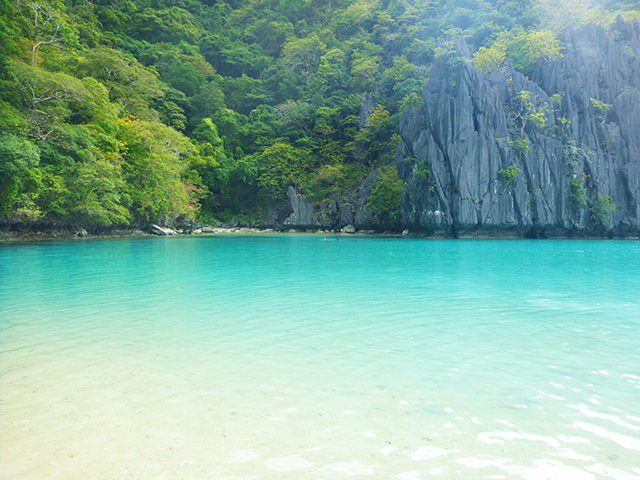 The fee goes to the local government, and helps support their efforts to protect and maintain the El Nido environment. Tour A: Lagoons and Beaches – This is the most popular tour, as the majestic limestone cliffs and deep turquoise waters of Big Lagoon are truly otherworldly. The best way to explore these lagoons is via kayak which are available for rent at each entrance for 300 pesos. Each stop on this tour is different and special in its own way. There is great snorkeling at Simizu where you eat lunch, Secret Lagoon is reached through a small hole but is also surrounded by a lovely beach with beautiful rock formations, and 7 Commando Beach is a great laid back place to swim and enjoy the beach at the end of the day. Because Tour A is so popular however, it can also get very crowded during peak season. Tour B: Caves and Coves – This is the third most popular tour with the stunning Snake Island, a sandbar with shallow swimming waters that connects two islands, as the most popular stop. If you’re into geology or archaelogy, you’ll find the caves on this stop interesting as jewelry and pottery dating back to the Song dynasty (960-1279 CE) were found there. The Pangalusian and Pinabuyutan Island stops both have wide stretches of powdery white sand and are ideal for lounging on the beach and snorkeling. If you want to beat the crowds of Tours A & C, this is a great tour filled with a good amount of adventure and relaxation. Tour C: Hidden Beaches and Shrines – This is the second most popular tour. Helicopter Island, named for being shaped like a helicopter, has a beautiful white sand beach with an underground tunnel at its north end and a reef on its south end. A short walk up Matinloc Island provides one of the most Instagram-worthy spots. Tapiutan is a great for snorkeling and spotting sea turtles, and Secret Beach is a can’t miss destination accessed by swimming through a small hole. Hidden Beach is truly stunning when you’re one of the few people there. This tour provides lots of opportunities for snorkeling and is the most adventurous tour. However it can be the most crowded tour as bottlenecks form at the small entrances. Tour D: Island Beaches – This is the least popular tour because of its proximity to downtown, as many people choose to kayak to Cadlao. But many guests tell us that Tour D was their favorite – even better than Tour A and C because there are very few people at all the destinations allowing you to truly appreciate each location. It’s a laid back day enjoying beautiful beaches. 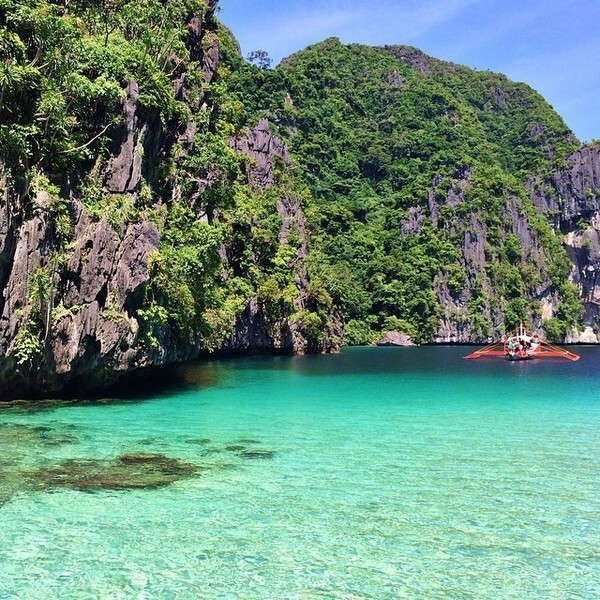 Some say Cadlao Lagoon is even more stunning than Big and Small Lagoon! 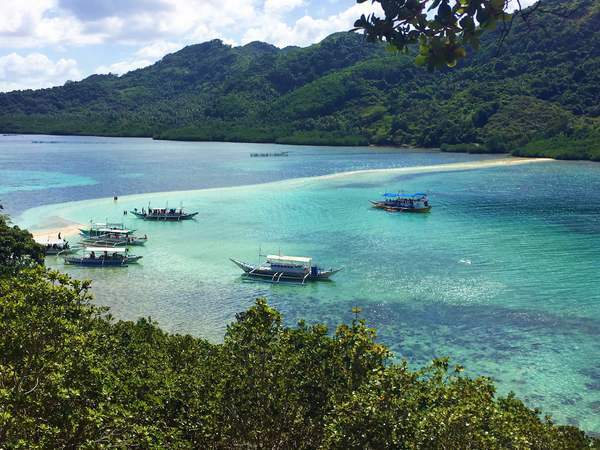 Nat Nat Beach, Pasandigan Cove, and Cadlao Lagoon are all on the island of Cadlao. Bukal Beach and Cadlao Lagoon have excellent snorkeling. If you’re looking to beat the crowds, spend a romantic day together, or have young children, this is the tour for you.